For some reason, it took me a while to figure out that even though I don’t own a Kindle per se, I can still take full advantage of being able to download and read all sorts of great titles using my Ipad and Iphone. Because, of course, there’s an app for that. 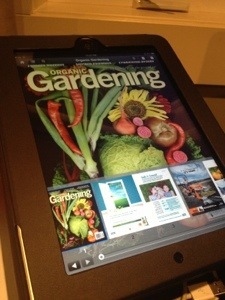 Having discovered this Kindle app, I have been delighted to find I can read some of my favourite magazines at a fraction of the price and without having to worry about adding to all the stacks and stacks of old paper magazines I really should be recycling (but can’t bear to part with because, you know, I might just need that article about the benefits of mason bees or the best way to use kale in a casserole…). 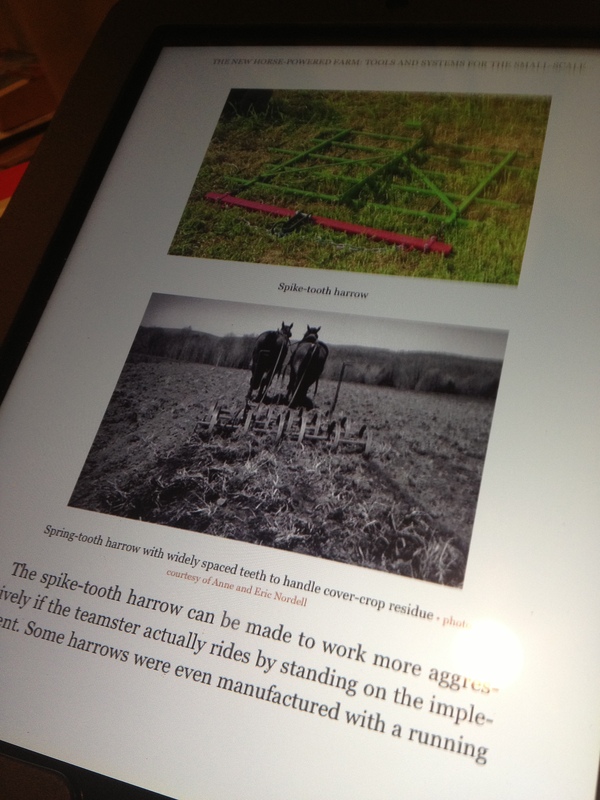 Not only was I delighted to be able to browse through virtual magazines to my heart’s content, when I was desperate to find something decent to read about the nuts and bolts of farming with horses, I was able to shop at some crazily late hour and download a couple of good reference books. These were not only delivered to the Ipad instantly (so I could read in bed), but I’ve been able to schlepp them around with me ever since so I could bone up on stuff like drag harrows when I’m standing in the lineup at the bank (now that I’m the proud owner of some awesome farming devices, I need a crash course on how to use them), I didn’t even need to have the Ipad with me as everything syncs automatically to my phone. For those of you who are shaking your heads in disbelief that I somehow missed this memo, I’m curious what books you are carting around in your phone/Ipad/Kindle/other e-reader. For those of you who, like me, took a while to warm up to the idea of virtual books, what’s holding you back? This entry was posted in Books, Horses, Uncategorized and tagged #atozchallenge, a to z challenge, e-books, farming with horses, Ipad, kindle. Bookmark the permalink. As my dad would have said, ‘it’s better than sliced bread!’. Like you, I’ve just started reading virtual books and marvel over the speed and ease of reading on the IPad. Currently reading ‘The Trickster’s Hat – A Mischievous Apprenticeship in Creativity’ by Nick Bantock. I’ll check out the magazine selections soon. You have access to thousands of ebooks – both downloadable and live stream, from you library. For free. No overdue charges. I admit the various collections are woefully short of farming books, but almost everything else is widely represented. All of which you cannot access with a Kindle, but which is most definitely available to android and iPad/iPhone users. It’s in Australia, but available to anyone in the world. This is a seriously cool collection which includes many ag classics that are now out of print, which Steve and others have made available in pdf.